The name damask is technically applied to certain classes of fabrics, richly decorated with figures of foliage, fruits, scrolls and other ornamental patterns, usually of a large and elaborate character. The weaves usually employed are twills ( mostly satin) and the figures In the fabric are made by alternately exchanging warp for weft surface or vice versa. The materials employed vary according to the purpose to which the fabrics are to be applied. In the manufacture of upholstery cloth for hangings and furniture covering, silk or worsted is used, while for tablecovers, towels, napkins, etc, linen is generally employed, except in the cheapest grades, when cotton is the material used. The name was derived from the city of Damascus, when that city was a centre for the production of textile fabrics, and originally was applied only to silken fabrics, whose designs were very elaborately woven in colors and often with gold thread. About the twelfth century the above-mentioned city, even then long celebrated for the production of its looms, so far outstripped all other places for beauty of design, that her silken textiles were in demand everywhere, and thus, as often happens, traders fastened the name of Damascen or Damask upon every silken fabric richly wrought and curiously designed, no matter whether it came or not from Damascus. In order to explain the modus operandi for the production of damask in this country, suppose we place ourselves in the position of a public designer, whose specialty Is the designing of patterns for such fabrics. The first step in the operation is to prepare a dozen or more sketches, which are to be shown to manufacturers to take their choice. This design or sketch is to be made into a damask tablecover, having 50 threads warp and 44 picks weft per inch, the figure of which is to be a 5-leaf 4—1 satin twill (warp face) and the ground a 5-leaf 1—i satin twill (weft face). Paper for warp ruled eight rectangles per large square; paper for weft ruled in the same ratio to eight as 44 is to 50. Operation: x : 8 : : 44 : 50; there­fore 44x8 equals 352 divided by 50 equals 7.04, answer. 7.04 is near enough to call it 7; therefore, 8x7 is the proper size of design paper required. TIE-UP. Then the tie-up must be considered, which in the present instance will be a 600-hook, with the tie-up as illustrated at Fig. 2 French system— point for border, and straight through for body, in six divisions. The next process is to enlarge the de­sign as it appears in the sketch, so that one repeat will exactly fit on 600 rec­tangles (warp) of the designing paper selected. After the design is transferred to the design paper, the next process is to paint in the weave, in the following manner, or as shown by a portion odt the design, taken from sketch .. Paint in the figure in solid red (vermillion or scarlet lake), keeping well within the lines. Paint in the 1—4 satin twill in the ground, running the twill toward the right. Paint in the 4—1 saittn twill in tine figure by using black paint over tlhe red. Twill to the left. so as to actually join, but a certain length of weft in the ground must join a certain length of warp in the figure. When painting in the satin twill of the ground in the border of the design it is necessary that the twill should ex­tend to the right for one-half the 'dis­tance and to the left for the remainder, therefore, as this breaking of the twill line causes a slight imperfection, which Is unavoidable, care must be used so as to make the break in such portion of the border as will render it unno-tieeable. Again it is necessary also to be care­ful so as to make the weave of the border join perfectly with that of the body; and this is done by carefully ex­amining the tie-up so as to ascertain which warp threads will join each other in the cloth and take steps to make a perfect juncture. In this particular instance, wa<rp thread No. 1, which is the first of the border, is in juxtaposition with warp thread No. 241, which is tlhe first of the body.There­fore the satin twill of the body, com­mencing with 'warp thread No. 241, should continue, without a break, the satin twill of the border finished at warp thread No. 1. Athough in the majority of damask faibrics nothing but satin twill weaves are employed (principally 5 and 8 har­ness), very good effects are sometimes obtained by combining other weaves with the satin twills. For instance, one side of a leaf may be painted In with a satin twill weave, and the other side may be a straight twill, thus giv­ing the leaf a shaded effect, which may be very pleasing. Another method of shading and the one generally employed is to gradually change from warp-up to weft-up or vice versa. TWO METHODS Of MAKING DAMASK. In damask there is probably a greater field for the production of large figures than in amy other class of weaving. 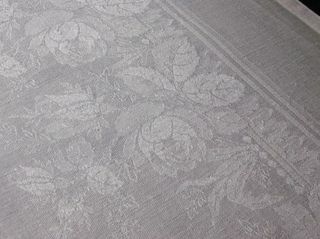 There are two methods of weaving damask. First, by the use of the ordinary jacquard, which is discussed in the present article, and second, by the use of what iscaJled the compound pres­sure harness. By the first method, although very elaborate figures can be woven and a fine oloth produced, yet by the second method a command isobtained over four or five times as many warp threads as by the first,thus allowingthe production of a fabric of much finer texture and even more elaborate ornamentation. A description of damask weaving by the use of the compound pressure har­ness will be given later. 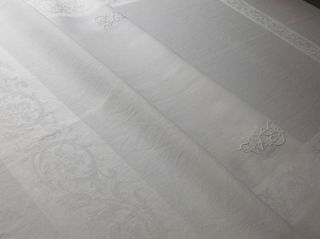 Where damasks are made all of one color, which is generally the case, as In white linen tableoovers, the effect is given by the threads lying at right angles to each other, and the light fall­ing upon them brings the pattern in bold relief and makes it easily visible. 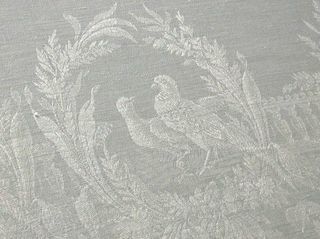 As it is impossible in the scope at the present article Co describe the bleaching, dyeing and finishing of all the various damask fabrics, we can at least say this—that in the case of the linen tablecovers, towels, etc, all the finishing required is bleaching, starch­ing and pressing. But a3 the beauty of the fabric large­ly depends upon its whiteness, it is es­sential that the bleaching of the cloth must be very carefully done. It is on of the excellence of her bleacheries that Ireland has been able to make Irish linen famous the world over. Cotton damask is made in several grades and should be considered as be­ing made in mills equipped with ma­chinery for making medium and high-class goods. The grades of cotton used' for this class of cloth are middling to-good middling, the staple varying from l1/! to 1% inches strong, according to the grade of damask to be made. THE WASTE LAP is run through with the raw stock lap at the finisher picker in tihe proportion. of three laps of raw stock to one of cut-waste, the cut waste being generally-put so that it will come in the centr* of the delivered lap. The cotton, after being mixed, is put througb a hopper opener and either two or three processes of pickers, two> processes being best, the speed of beater being 1050 revolutions per min­ute for openers, 1,500 for breakers and 1,450 for finishers, also 1,450 revolution per minute for intermediate pickers, When used. This gives about 42 beat per inch at the finisher. The weight of laps should be 40 pounds at breaker, 37 pounds at intermediate and 36 pound at finisher.